unsaturated and are mostly plant-based in origin as opposed to saturated fats which are typically found in animal-based foods. The worst fat of all is trans-fats which is typically a by-product of processing used by manufacturers to enhance the shelf-life of some foods. based oils, and dark chocolate. Various studies on MUFA rich diets show that these super healthy fats enhance heart health, protect against chronic disease, increase weight loss and body fat loss especially in hard to lose places like your belly. These fats have also been shown to slow the bio markers of aging, prevent cancer and heart disease and reduce inflammation! As an added bonus, MUFAs are satisfying and filling. 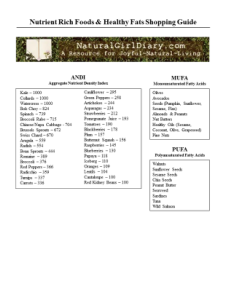 Download this printable guide to help find foods with healthy fats while shopping.